Fly half Josh Lewis helped steer Dragons to a first Guinness PRO14 win of the season as they defeated the Isuzu Southern Kings in a pulsating encounter at Rodney Parade. Lewis, a summer recruit from Bath, celebrated his first start by grabbing a 17-point haul and helping Dragons over the line after a topsy-turvy league encounter. 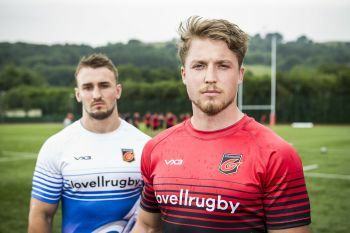 Dragons had made a lightening quick start to the league game and went ahead after tries from back row duo Ollie Griffiths – later named man-of-the-match - and Aaron Wainwright. Kings captain Micheal Willemse and Bjorn Basson responded, with Rhodri Williams off the field to a yellow card, as the home side took a seven-point lead to the interval. The South Africans then levelled it up when Godlen Masimla went over in the corner, but up stepped Lewis with an ice cool penalty before he raced over from distance to wrap up the points. Head Coach Bernard Jackman made five changes with Ross Moriarty in for his debut and Lewis, Elliot Dee, Brok Harris and Matthew Screech all called up. And his new-look side started strongly, full back Jordan Williams ghosting past tacklers and feeding fed Hallam Amos who found Moriarty at full speed. The Wales international took two men with him as he crashed through and the ball was recycled quickly for Griffiths to bulldoze over from close range. Griffiths was in the thick of the action as he won a penalty moments later, after a dangerous clean break from visiting Number Eight Andisa Ntsila. Lewis saw a penalty from halfway pull up short and wide, before Dragons struck again when Wainwright did brilliantly to charge down a clearing kick from Banda and react firstto the loose ball. Lewis did extend the lead with a sweetly struck penalty from 40 metres, after Kings were caught playing inside their own half and illegally played the ball on the floor. The Kings, though, were not finished and rallied with Dragons were down to 14 men, after Williams was yellow carded for a deliberate knock on. Captain Willemse was at the back of the rolling maul for a try and seconds later the South Africans used width and Basson flew down the left wing to score a second. Lewis missed a penalty as Dragons looked to respond while Leon Brown thought he has scored on the stroke of half-time, but his stretched attempt over bodies was ruled out by the TMO. The Kings came out strongly at the start of the second half and only a brilliant last ditch tackle from Dixon stopped Michael Makase. But the South Africans did strike back just before the hour when turnover ball on halfway was fed quickly through hands and Masimla raced away with Banda’s conversion levelling the scores. Lewis looked to settle home nerves with a penalty, after a scrum infringement from the Kings. And then the fly half scored the try of the game as he superbly took a high box kick from Williams and showed his pace to blast past two men and score under the posts to a huge ovation. The Kings forced the home side to dig deep in the closing stages and Yaw Penxe scored – after the TMO – to grab two consolation points.